Stiles leads Scott out into the Beacon Hills Preserve to get drunk. Scott claims that he didn't get dumped but they are instead "taking a break," but Stiles fails to see the difference. He produces a bottle of Jack Daniels with a grin. Half a bottle later, Stiles lays on the ground near a barrel with a fire, rambling about how there are so many other fish girls in the sea. And that he loves girls, especially ones that fit exactly Lydia's description. Scott just sort of watches him, showing no effects from the alcohol. Stiles tries to get him to drink more, but Scott doesn't feel like it. Stiles surmises that Werewolf can't get drunk. He then tells Scott that no matter how much being broken up hurts, being alone is way worse! Stiles laughs at how much that didn't make sense. Two strangers find them, then, and grab the bottle of Jack. Scott starts to get angry and orders them to return the bottle. "You brought me here to get drunk, Stiles. I'm not drunk yet." The intruder takes a swig, and Scott gets to his feet. He orders him to return the bottle and then starts to wolf out. The man hands it over, and Scott chucks the bottle against a tree. As they're leaving, Stiles asks Scott if he wolfed out because of the break up or if it's because tomorrow is the full moon. Scott doesn't say anything. He just leads Stiles back to his Jeep and puts him in the passenger seat. Then he glances at the woods. The two intruders are still out there, and as one complains about how cold it is, the other vanishes. The bloody claw of the alpha wraps around the remaining one's ankle and drags him off, screaming. It returns him to the camp site and drops him into a barrel of fire. Scott's alarm goes off declaring it Monday morning, and the night of the full moon. This is a continuity error, as it has not been 29 days since the last full moon. The radio also says that school was closed on Thursday and Friday, placing 1x07 - Night School on a Wednesday. The authorities are still searching for Derek. Melissa hurries into Scott's room and turns off the radio. She asks him if he's ready to go to school or wants to stay home another day or wants a new car. He reacts to the last one, and she smiles. "Me too." She tries to get Scott to talk about the break-up, but he says he doesn't want to talk about it with her. He then declares that he's going to get Allison back. Chris Argent drives Allison to school but isn't quite ready to unlock the door and let her leave. He looks around at the officer assigned to the school and the busted window and then asks Kate what her opinion on home-schooling is. Allison smiles and shakes her head. "What's your opinion on overprotective dads who keep ruining their daughters' lives?" Kate doesn't answer, instead she leans over toward her brother and hits the button to unlock the doors. After Allison is gone, Kate starts to talk, but Chris stops her. He admits that they should have acted sooner and he should have listened to her. She gives him a look and tells him that she was just going to suggest they stop and get gas. In between classes, Allison talks to Lydia about how weird it is that no one knows they were the ones in the school that night. Allison asks her if she made the right decision with Scott. As far as Lydia sees it, Scott locked them in a classroom and left them for dead. Stiles is sitting outside the principal's office, waiting for his dad to come out. The Sheriff comes over and asks him if he has a test to get to. Stiles asks if he's found Derek. He then tells his father that he has to be especially careful tonight. The Sheriff says he's brought in a state detective to help him, because he's never dealt with anything like this. Stiles wants to tell him more about why he has to be careful, but he can't, so he hugs his bookbag and leaves. In the lecture hall, Scott spots Allison at her desk and tries to talk to her, but Mr. Adrian Harris stops him. Scott takes a seat in front of Stiles instead. They have 45 minutes to finish their exam. Scott tries to start the test, but his senses quickly go into overdrive. He can hear all the pencils scratching and erasers rubbing on paper. When he reads the test question it says, "Why would a pretty girl like that go out with a loser like you?" He rubs his eyes and tries to focus, but the next question reads: "When the moon is full tonight, will you kill: A. all of your friends? B. some of your friends? C. most of your friends? D. none of the above?" The clicking and ticking and buzzing becomes overwhelming, and Scott runs out of the room before he freaks out. Stiles takes off after him. He finds Scott's bookbag in the middle of the hallway and tries calling him. Stiles can hear Scott's phone ringing close by and follows the sound into the boys locker room. He finds Scott standing under a shower. Scott tells him he can't breathe, and Stiles digs Scott's inhaler out of his backpack. Scott takes a puff and looks utterly confused. "I was having an asthma attack?" "No, you were having a panic attack. But thinking you were having an asthma attack actually stopped the panic attack. Irony!" Scott asks Stiles how he knew to do that, and Stiles tells him that he used to get panic attacks after his mom died. Scott tells him that looking at Allison was like being hit in the ribs with a hammer. Stiles confirms that that's heartbreak. Scott says he can't stop thinking about her, and Stiles tries to help by saying that the werewolf hunter/Werewolf thing was bound to become an issue at some point. Scott just scowls at him. Then he tells Stiles that he can feel all the emotions in the room around him, which they figure must be do to the full moon. Stiles says they'll lock him in his room like they planned, but Scott thinks they need to go farther. He thinks if he gets out he's going to kill someone. At this point, Scott and Stiles both believe that Deaton is the alpha. The Argents are planning their next move. The alpha, like every other Werewolf, struggles to maintain control under the full moon. It won't be focused enough to pick a target. Kate wonders out loud what would happen if the alpha did have something to focus on, claiming that she doesn't like surprises. One of the hunters asks about Derek. Kate says Derek's too smart to be out tonight, especially with all the cops around. Victoria Argent comes in and says that if Derek is out they are to cut him in half. "Anybody want a cookie?" Jackson takes a seat next to Allison in the lunch room. She has a bit of jelly on her lip, and he takes the opportunity to wipe it off for her and then lick his thumb clean. "Do you want the bite?" he hears her ask, and it startles him. When he asks her to repeat it, she says, "Do you want a bite?" and offers him some of her food. He demurs, touching the wounds on his neck. They ask each other how they're doing after the incident. Allison says she's mostly thinking about Scott and that she hasn't talked to him. Jackson tells her that's for the best and that Scott got exactly what he deserves. Out in the hallway, Scott bangs his head into the wall so hard he breaks some tiles. At lacrosse practice, Coach Bobby Finstock says that because of a pink-eye epidemic some new people are making first line on a probationary basis. He calls out Rodriquez, Taylor, and Bilinski. 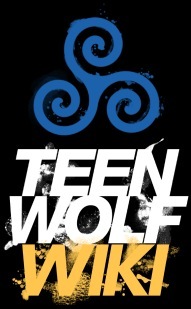 Stiles jumps to his feet in triumph, howling and cheering. Finstock tells him to shut up, much to the rest of the team's amusement. "Stiles," Scott says, looking over at him. "It's Biles. Call me Biles or I swear I'll kill you," Stiles says. Finstock also announces that they're switching Co-captains and Scott is in. Jackson is stunned, but Finstock assures him that this is about taking Jackson's unit and Scott's unit and making one big... unit. Jackson glares at everyone. Stiles cannot be more thrilled. Jackson's nameless friend assures him that this won't last long because they'll put Scott in traction. Danny, however, points out that Scott scores more than anyone else. "Oh, is that the opinion of my best friend?" Jackson asks. "The opinion of your best friend is who the hell cares who's team captain? He's a good player, and you need to seriously get a grip." Scott is nowhere near as happy as Stiles thinks he should be. Scott tells him that he could smell the jealousy coming off Jackson, thanks to the full moon turning up his senses. Stiles then asks Scott if he can smell sexual desire. Scott is tired of the conversation before it started, but he asks if Stiles is specifically asking about Lydia. Stiles denies it but then recants and says that he just wants to know if he has a chance with the girl he's been obsessed with since the 3rd grade. He asks if Scott can just ask her if she likes him and see if any pheromones come out. Scott agrees. He approaches Lydia and asks her to talk. They go into Finstock's office. She asks him if he wanted someone to talk to about the other night. Instead, Scott asks her of Allison still likes him. She tells him she does, but just as friends. Lydia then says that Allison made a big mistake. "I know that you locked us in there to protect us. That when a guy risks his life for you, you should be grateful." Scott anger and disappointment get the better of him, and his animal instincts start taking over. He looks up at Lydia and asks her if she's grateful. She can be very grateful, and they start kissing. When Scott goes out on the field, Stiles is anxious to hear what happened. Scott tells him that Lydia said she's totally into him. During practice, Jackson's friends make it a point to knock Scott down. Finstock knows it's a status thing but doesn't make them stop. Stiles is about to take his shot, but Scott shoves him back to take another round. Scott wolfs out a little, his eye going gold, and he runs at his teammates, knocking down anyone in his path. He hits Danny in the face, and the whole team comes running out to see if he's okay. Stiles asks him what the hell he's doing. "Everybody likes Danny. Now everybody's gonna hate you." Lydia comes running over to see if Danny is okay, and Jackson notices that her lipstick is smudged. Stiles sees and realizes that something happened between Lydia and Scott. Meanwhile, Kate is teaching Allison to shoot a taser. Allison is aiming at Mr. Bear, the teddy bear she's had since she was 5. Allison shoots the bear, but it only makes her more upset. "I just don't know what happened." Kate tells her that she's going to break hearts left and right. Allison replies that it felt so right with Scott but he started acting strange and now she's not sure if she did the right thing. Allison mentions Derek, and Kate stops her to clarify that Scott knows Derek. Allison tells her they aren't friends. Kate demands that Allison tell her everything Scott has said about Derek. Stiles arrives at Scott's house and uses a key to get in. Melissa is surprised to see him, and Stiles tells her that he got a key made. He drops the bag he's carrying on the floor, and it rattles. He tells her it's a school project. She asks him if Scott is okay. "He just doesn't talk to me that much anymore. Not like he used to." Stiles admits that Scott's had a rough week. They wish each other a safe night, and Melissa makes a joke about it being the full moon. Stiles stops dead. But she goes on to say that the ER gets crazy on a full moon. Stiles heads up to Scott's room and turns on the light to find Scott sitting in his chair by the window, mirroring Derek's creeper moves from earlier. "Dude, you scared the hell out of me." Scott tells him that he came in through the window. He glares at Stiles and says that he's fine as Stiles opens the bag to show him the chains he bought. Scott says that he's just going to lock the door and go to sleep, but Stiles tells him he has a serial killer look in his eyes that's starting to freak him out. Stiles asks Scott to take a look in the bag. Scott picks up a fist full of chains. "You think I'm going to let you put these on? Chain me up like a dog?" "Actually, no," Stiles replies. He dives at Scott and handcuffs his wrist to the radiator. Stiles tells him that he's protecting him from himself and punishing him for making out with Lydia. At the sporting goods store, Allison tours around through the archery section. She picks up a sight and finds herself pointing it at Jackson. They talk. Jackson's picking up a new helmet for Danny. He tells her what Scott did and then offers to be a shoulder for her to cry on. Stiles goes back into Scott's room and pours some water into a dog bowl for him. Scott chucks it at him. "I'm gonna kill you!" Stiles yells at him for kissing Lydia, the only girl he's ever wanted. He's been telling himself that it's all just because of the full moon and Scott will stop being a dumbass once it's over. But Scott goads him further by telling him that Lydia kissed him. Stiles leaves the room as Scott describes how Lydia had her hands all over him and would have done anything he wanted. Allison and Jackson are sitting in Jackson's parents' car. She wants to tell him something but only if he promises not to laugh. "I don't think it was Derek in the school." Jackson says he doesn't either. Scott struggles against the handcuffs and starts begging Stiles to let him out. "It's the full moon, I swear. You know I wouldn't do any of this on purpose." His expression shifts, like he knows this is the best play he has, so he keeps going. He admits that Allison broke up with him and tells Stiles that he feels completely hopeless. Stiles tells him that he can't let him out. 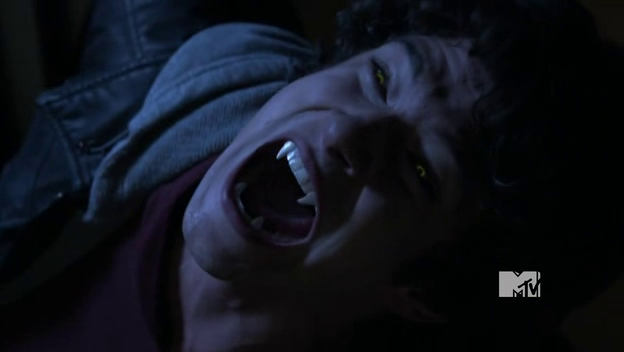 As the light from the full moon hits Scott, he shifts and starts screaming. Jackson tells Allison that just because she can't trust Scott doesn't mean she can't trust anybody. She tells him that her family has been lying to her, too. She says she has a weird feeling that her dad knows more about what happened at the school than they do. Stiles sits in the hallway listening to Scott screaming and almost cries. But then all of a sudden the screaming stops. Stiles goes in to check on him to find the handcuffs broken open. Scott runs through the woods heading straight for Allison. He finds her still talking to Jackson. Jackson is telling her how he saw a shape that looked like a man, but then it got down on all fours and ran away. It moved like an animal. Scott thinks he sees them kissing and gets angrier. He makes a run for the car. Scott lands on the roof, but before he can attack, Derek tackles him and sends him flying. Scott tries to fight him, but Derek doesn't fight back, instead dodging and throwing him without trying to hurt him. Derek slams him into the ground and then roars in his face. This seems to break Scott's bloodlust, and he gives Derek a confused look. "What's happening to me?" he asks. "Exactly what he wants to happen," Derek replies. Stiles was driving toward the preserve to look for Scott, but when he arrives there are police cars and an ambulance. They wheel out a dead body. Stiles thinks it's his father, and he gives him a big hug when it turns out it isn't. The Sheriff looks confused and concerned as he hugs him back. The Argents roll up, and Kate points out Stiles as one of Allison's friends. She asks Chris whether the smaller of the two betas he came across could have also been younger. They give Stiles a knowing look. Derek brings Scott back home. Scott manages a thanks, and Derek looks so unsure of what to do with that that he turns to leave immediately. Scott asks him to wait. "I can't do this. I can be this and be with Allison." He asks Derek if there's a cure. Derek tells him that he doesn't know if it's true, but the only thing he's heard is that you have to kill the one that bit you. Scott looks distraught, because that seems pretty impossible. Derek offers that if Scott helps him find him, they can kill him. When Jackson gets home, he notices a fingernail stuck in the door of the SUV. He takes it and matches it to the ruined glove he took from Scott. Wolfgang Gartner - "Hook Shot" Scene: Scott hurts Danny and two other players during lacrosse pratice.